Bayou Renaissance Man: Preparedness book proposal - what do you think? Last week I reviewed Selco Begovic's new book. As a matter of fact, Selco's book has got me wondering whether I shouldn't write one of my own, about the lessons learned in SHTF situations in the many and varied circumstances in which I've found myself over the years. I must think about that. Many of you left comments or sent e-mails to say that I should, indeed, write that book: so I'll add it to my plans for this year. I'd like to get your input on how it should be structured, and what it should contain. I'm in a bit of a quandary here. If it's too much "I was there, and I saw this", then it won't have enough room for the practical information I'd like to include. If it has too much of the latter, it won't have space for very much of the former. What balance should I aim for? If you have suggestions to offer, or want to nominate subjects you'd like me to cover, please let us know in Comments. I'll take them into account in planning the structure and content of the book. Also, if there are areas in which I have little or no experience, I might bring in others to write those sections, to make it more practical. A big part of survival is the mental agility to recognize that the situation has changed. Things are not the same any more, and you cannot conduct business as usual. Hi Peter, I've been following your blog for a few years via RSS, but never really felt the need to comment before now. I read Selco's blog while it was still going; there's a spectrum of writing extending from his worst-case scenario to, say, Dmitry Orlov's work. Personally speaking, I'm British; I've lived in various Asian countries, Russia, and also in Lesotho while neighbouring South Africa still had apartheid. In other words, like yourself, I have experience of a number of countries where the S has comprehensively HTF - but in different ways, and to different degrees. What that means is, I don't think there's any book you could write that would be a useful plan for action that would work for more than a few readers. Everyone would have to develop their own strategy for the worst case, and anyway there are alread plenty of doomsday-prep books on the market. What I would look to you for, wiith your broad experience in different cultures and countries, is two things. First is a list of warning signs that trouble is coming. Ferfal, for example, wrote about his experiences in Argentina - demonstrations more frequent in the street, rises in street crime, shanty towns appearing overnight on waste land and public gardens, more home invasions and car-jackings... What changes as a society starts to fall apart? Second: one thing that I vividly remember from Selco's blog was his description of how seemingly normal people, those really nice people next door, became sadistic killers once they understood there was no authority any more; how critical it was to have a group of people you could literally trust with your life. Do you have examples of A-B testing: how, when SHTF, some communities fell apart, while others held together? What would explain the difference? Can that be reduced to an understanding of how to build a resilient network of trust while there's still time? As far as balance between stories and information, I think starting off with a story in each chapter then tying it into the subject of discussion would be an excellent plan. You need to hook the reader from the start with a startling story, then get to the meat and potatoes of prepping for it. "Practical tactical", somewhat as Bogatyr suggested above, would be quite useful. How to recognize when modern society, such as it is, tips over into uh-oh here it comes. And what to have ready to be prepared for it. I think it would be good to use examples, as Rose suggests, to start off each chapter or sections would be good. Secondly, I think it would be better to focus on how to respond to localized and likely events versus large scale but unlikely events: Think 'end of your world' instead of 'end of the world' situations. I agree with both Jonathan H, and Bogatyr. Networking for trust before the SHTF, and what signs show up that may be a warning to pay attention too, rather than signs that just alarm you but eventually are nothing. We all see and hear and read thanks that make us go Hmmmm? However some of those things have deeper meanings, and some don't. Some tips on how you might differentiate the two would be grand. Also, just speaking for my self, I don't see (much) need for Fanboy Guntalk in the book. I'd rather read about more practical things. There are a lot of "how to" books out there on surviving when TSHTF but most are not written by someone who actually did it. What I've read by Selco is not so much him telling someone "how to" as he talks about "what he did" in that situation. The value of a wall about the home compound, the value of a hand gun, the value of a bic type lighter, what had to be done to go trading when something was really needed. His experiences, real every day experiences in living thru that is the value of his writings. I think a short-vs-long term perspective would be very useful. A conservative-leaning fellow congregant at Synagogue lives in the local city-proper; they have a few weeks of dried food (and I suspect some guns and ammo but I haven't asked, and they haven't said). The parents are from the Ukraine too, so between the Shoah and the Holodomor they have knowledge of what can happen. Am I where I'd like to be, survival-wise? No, but I am a long way past what most of the sheeple are. Could my family survive two weeks without power? Easily. Four weeks? Probably. Three months, which I've read is a "reasonable" worst case scenario short of an EMP or global war, likely... with water being the big issue. But I do think that having varied thoughts about the time scale of the event, whatever it is, would be useful. "Also, just speaking for my self, I don't see (much) need for Fanboy Guntalk in the book. I'd rather read about more practical things." It doesn't get much more important or practical than security for yourself/family/group/neighborhood, when things go pear-shaped. All your things, including your family members, are up for grabs when society breaks down. Wishful thinking and a dollar won't even get you a cup of coffee in that situation. Selco made it real clear on his blog, that guns were an important resource in bad times. Better to have them beforehand, then to think you can acquire them when it becomes obvious "Bad Times" have arrived. For example, CA mandated all gun stores close when the Rodney King Riots hit LA. Even in San Jose, any business that handled guns was closed. People who were scheduled to pick up guns that were on hold for CA's waiting period were turned away. No ammo was allowed to be sold. The governments at all levels don't care about your safety. Plan accordingly. 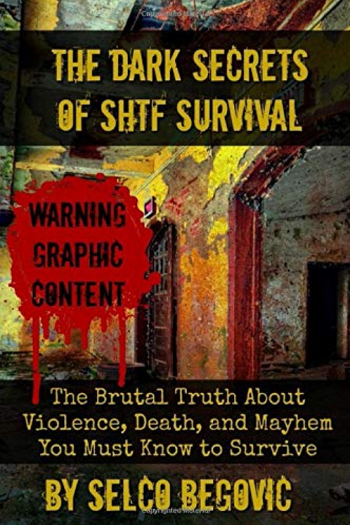 I honestly don't know a topic that hasn't been beat to death in the shtf literature. But the things you allude to from your days in Africa? I just hope a shtf book doesn't preclude an autobiography focusing on your Africa days. Will, to clarify what I said about guns. I recognize the need for them. However some of the SHTF stuff I have read goes way beyond preparedness and off into "Zombie Killing--How and What". I really believe when you have gone that far, you're drifting into fantasy. Are they needed? Most Certainly. After that though, I prefer a short practical guide, rather than a long technical discussion, about detail that for all intents become (mostly) trivial in a survival situation. That is what I think, anyhow. Personally, I'd have preferred a $6 kindle edition. This appears to be a regurgitation of his blog in large print format. I'm about halfway through and I've yet to discover a dark secret. I will say that the line about you thinking 500 rounds of ammo would be enough only to expend it in the first few days, and now your rifle is useless. There's a conflict here between hoarding what you need, but then needing to flee, leaving it all. Enough grousing. You ought to write a book seeing as you probably have more varied experience. You also could make it reconcile with US culture. A lot of your writings on prepping are more appropriate to us. I have a hard time conceiving sectarian violence like in his homeland. I'd be stunned to see tanks in my neighborhood. I think the US is headed towards a different catastrophe - a financial one. Eventually, the debt, social security, and welfare will collapse and there'll have to be realignment in who scarce dollars go to support. There'll be a lot left standing when the music stops. Who knows what happens then. I can see gangs of team black and brown going for looting houses. However, I think in my area, that may happen once or twice, then lead will fly. It's all fun and games until your crew gets cut to ribbons. It's a different mix here. I may not be prepped as well as I'd like, but there's a huge population that has zero skills other than picking up fast food or microwaving dinner. So, yeah. I'd buy your book. It'll be more relevant and interesting. A short story of your experience for a situation. Then a section going over recommendations. Figure out how many chapters you want. Or perhaps make a list of what topics you want to cover. And then how long each story would be. This way you have a roadmap / framework for your book. What Ray said. I won't complain if it takes a couple of books to cover your backstory and what worked and what you would do differently as a result. Pat had interesting points. However, he, as too many people here in the US, have a lack of imagination as far as how bad things COULD get. He points out when teams get cut to pieces, they will stop. I think not. I think they will decide that overwhelming numbers will carry the day, and create convoys of wrecking crews. How do you deal with desperate groups of fifty vehicles, or more? In most cases, they WILL prevail, with numbers like that. Success will breed copycats. This will take a group effort to stop. We are a transportation rich nation. The BG's will not forage on foot, for the most part. Peter you're a great storyteller. Instead of an introductory section, how about kicking off each chapter with an experience or two and then detailing the lessons you learned from each? They could be both positive and negative - what you did right and what you did wrong - and could easily be divided up by category.